2. I’ve been looking into lightening up cocktails for the spring and this weekend we tried out Grapefruit Mojitos which were incredible delicious and refreshing… get the recipe HERE! 3. 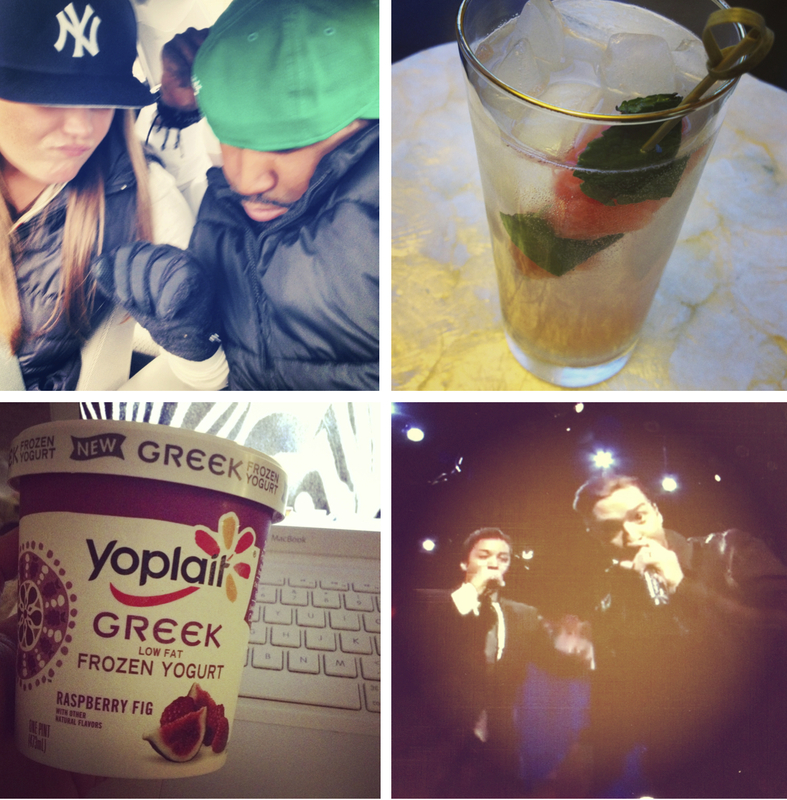 Speaking of lightening things up, have any of you tried Yoplait’s new Greek Frozen Yogurt (find it HERE)? I had tried Healthy Choice’s version (find it HERE) and thought it was okay but this is way cheaper ($1.50 for a pint as opposed to HC’s price of $3.99 for three 3.8 ounce cups) and much tastier! I had the Raspberry Fig flavor but there were so many yummy ones to choose from! 4. I was happy to wake up Saturday morning and discover that Jimmy Fallon and JT did a Part 4 to their “History of Rap”…. In case you missed it, do yourself a favor and check out Parts 2 & 3 HERE and the new one HERE. 1. We started some spring cleaning last Saturday which took up most of the day. One of the big projects was going through my husband’s closet to get together a big chunk to donate, pick out what needed mending and what needed to be stored away for spring. Weezy loves when we do this because she burrows into the clothes and naps. The sweater she’s wearing is one made using my tutorial, find it HERE. 2. We were busy trying out a lot of new recipes last weekend and this was the filling for some spring pea ravioli that were good but definitely need some tweaking. I can’t wait to make them again with some changes and share it will you all once they’re perfected! 3. Another one of our new recipes, we made a Chai Pistachio morning cake for breakfast on Sunday and it was life-changingly good! Find my post on it HERE! 4. We made an incredible spring pasta dish for dinner on Sunday night, which wasn’t very Irish of us lol. 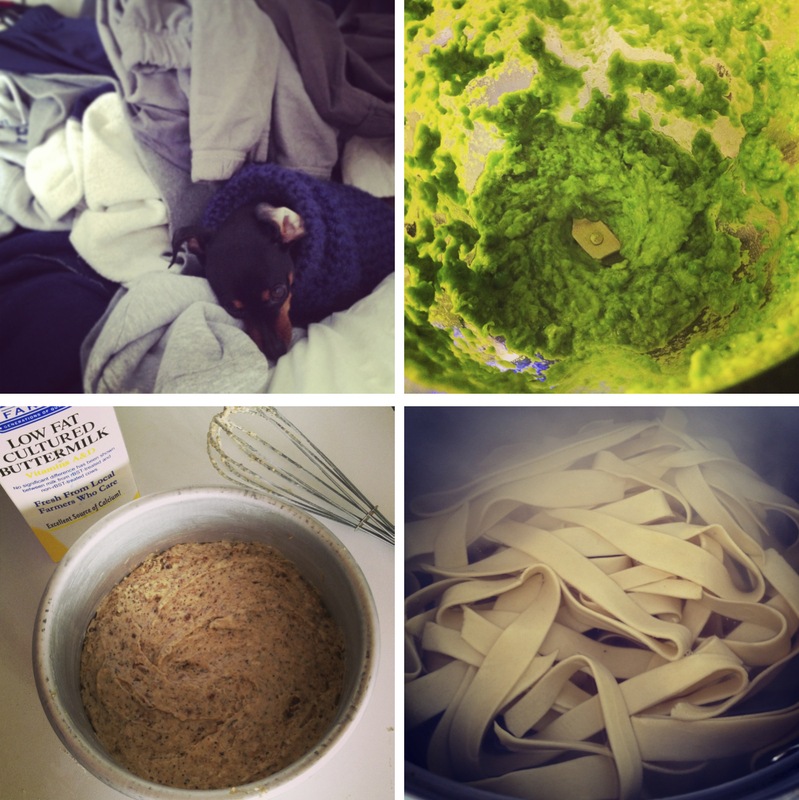 Be sure to check out my post HERE to learn how you can make handmade pasta yourself! 1. After being sick the week before, I felt like I really needed to make up for lost time so I spent a lot of last weekend working. While everyone was downtown at the St. Patrick’s Day parade I was cooped up in my office, but some good music & a glass of Sauvignon Blanc made it more bearable! 2. Remember my “Good Morning Gorgeous” mug from instagram a few weeks ago (see it HERE)? I had planned on DIY-ing it but found these re-writtable mugs at the Dollar Tree in the kids craft section! My husband writes a new message for me each morning and leaves it by the coffee maker… coffee mugs are the new love note! 3. When my mom and niece went shopping in Erie a couple weekends ago (see pics HERE) our main destination was Charming Charlie (find them HERE). I had never been but everyone kept telling me I’d love it and boy were they right it’s like heaven for me. Rooms & rooms of jewelry all divided up by colors it was incredible! This is what I picked up that day (pastels all ready for spring!) sitting on the console table in our room (see that HERE)! 4. I continued our spring cleaning to-do list throughout this week when I had some time, one of those projects being cleaning our oven! 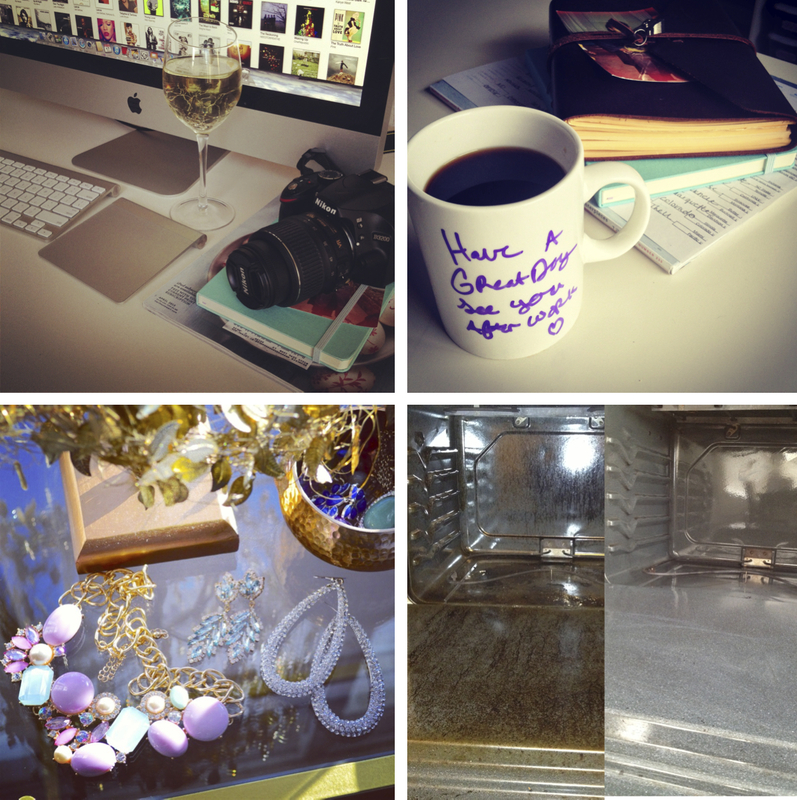 Find my Spring Cleaning Checklist and Tips post HERE! JT and Jimmy Fallon need their own tv show. Like right this moment.